Please be patient - download may take several minutes. Music, singing & piano accompaniment - David A'Bear. The immortal and haunting words of Thomas Hardy sympathetically set to music. The pianoforte accompaniment sets the mood from the start, depicting the crisp, sparkling frost and stark, austere wintry scene; and the vocalist sings with melancholy through the first two stanzas as the accompanist adds colour to the words. The third stanza brings great contrast with a complete change of mood as the darkling thrush makes its appearance, and the changes in time signature and tempo and the staccato passages serve to emphasise the excitement. The bird-song interjects with the vocalist, but in only a short while the bird has flown and the music consequently lapses into the opening gloomy portrait. The fourth stanza is a variation of the first, but the words are more contemplative and are sung with greater hope. The bird-song interjections recur in the singer's mind's eye and also serve to remind us that the thrush brought him not only hope but the reassurance that all would be well in the end; so the final bars of music bring a calm and peaceful conclusion where, as one might expect, the bird-song has the last say. I leant upon a coppice gate when frost was spectre gray, And winter's dregs made desolate the weakening eye of day. The tangled bine stems scored the sky like strings of broken lyres, And all mankind that haunted nigh had sought their household fires. The land's sharp features seemed to be the centuries corpse outleant. His crypt the cloudy canopy, the wind his death lament. The ancient pulse of germ and birth was shrunken hard and dry. And every spirit upon this earth seemed fervourless as I. At once a voice arose among the bleak twigs overhead, in a full-hearted evensong of joy illimited. 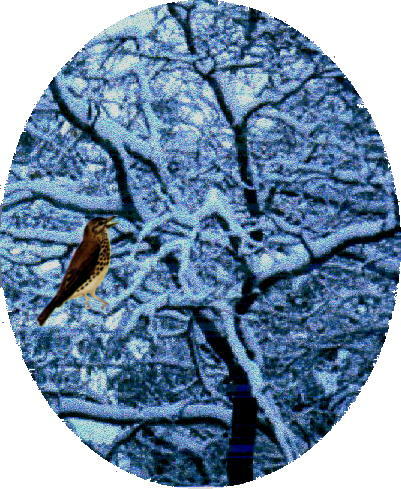 An aged thrush frail gaunt and small in blast-beruffled plume, had chosen thus to fling his soul upon the growing gloom. So little cause for carolings of such ecstatic sound was written on terrestrial things afar or nigh around. That I could think there trembled through his happy goodnight air some blessed hope whereof he knew and I was unaware.